Cult Nails Annalicious is orange/red jelly full of orange and gold shimmer. This almost looks like a glass fleck polish. The color is so vibrant and has an amazing glow. I love, love, love colors like this! The formula and application were flawless. I didn’t even need to do any clean up. I applied two easy coats with HK Girl top coat. Perfection! Cult Nails polishes are available for European customers at Norway Nails. You can use the code “POLISHAHOLIC” to get -10% off of any purchase. 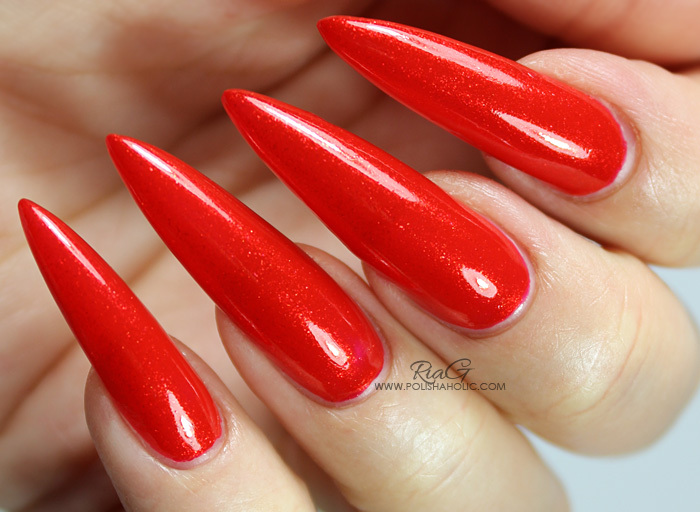 Norway Nails offers a wide range of gorgeous indies and other polish brands. You can also follow them on Facebook and Twitter. ***Annalicious was sent for review, HK Girl was gifted to me me. I don’t benefit from clicking any of the links on this post or use of the discount code in any way. 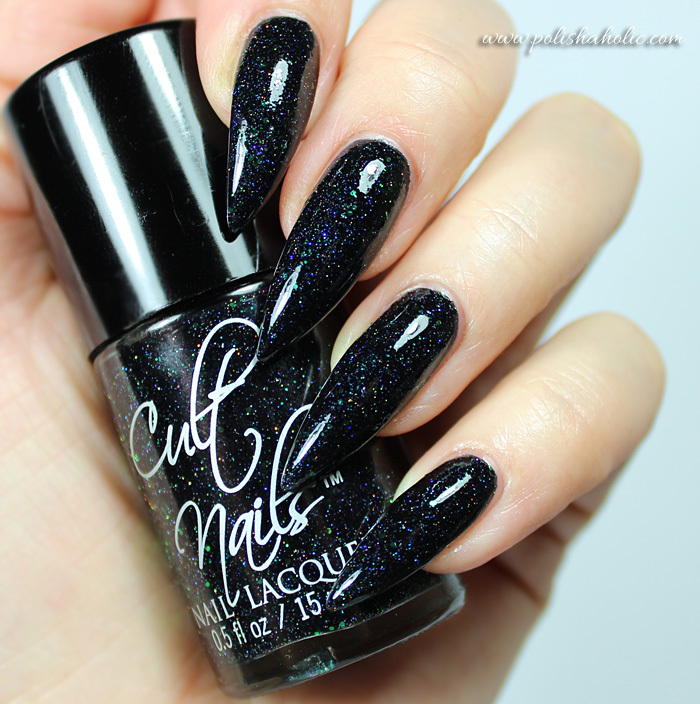 Here’s a perfect polish for New Year’s Eve celebration for those of you who love dark nail polish. 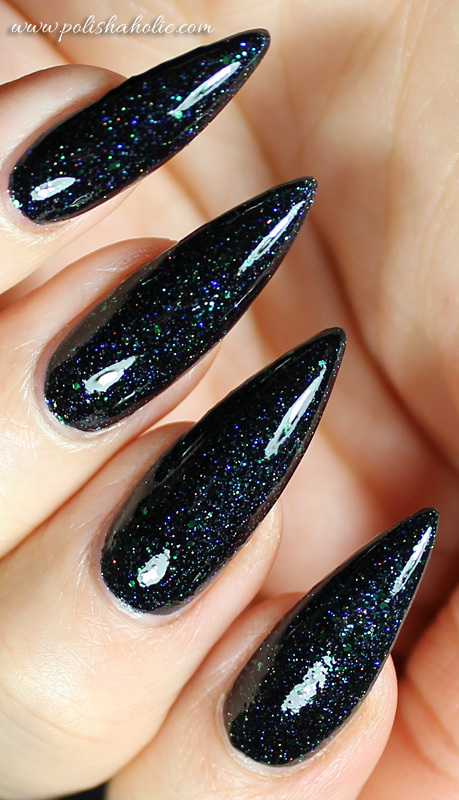 Cult Nails I Got Distracted is black jelly with green glitter and holographic shimmer/microglitter. Very beautiful and sparkly! Formula was good and application was easy. Tiny bit of balding on the first coat but everything evened out perfectly with the second coat. Dry time was also quick. Very good quality polish. This dries a little rough so you’ll definitely need to use a top coat with this one though. For this manicure I used two coats of I Got Distracted and HK Girl top coat (This is also now available on Norway Nails). ***I Got Distracted was sent for review, HK Girl was gifted to me me. I don’t benefit from clicking any of the links on this post or use of the discount code in any way. 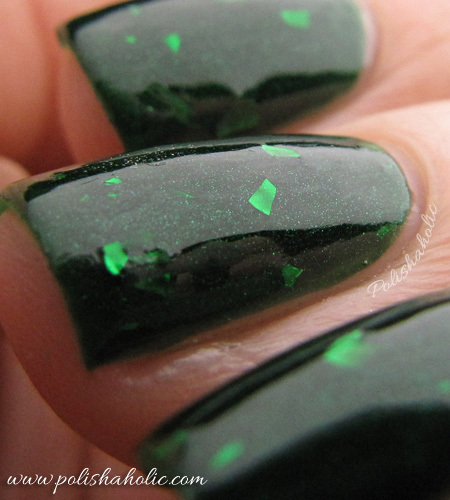 Today I have a real treat for all of you green polish lovers out there, Cult Nails Coveted. This is a deep emerald green jelly, with flakes and a lot of very fine shimmer. I kept staring and admiring my nails constantly when I was wearing this. Truly a stunning one! 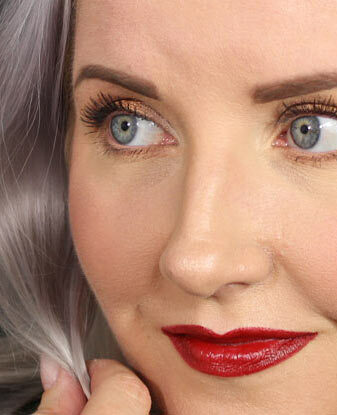 Formula on this is great, it applies smoothly and two coats is enough for semi-opaque result. 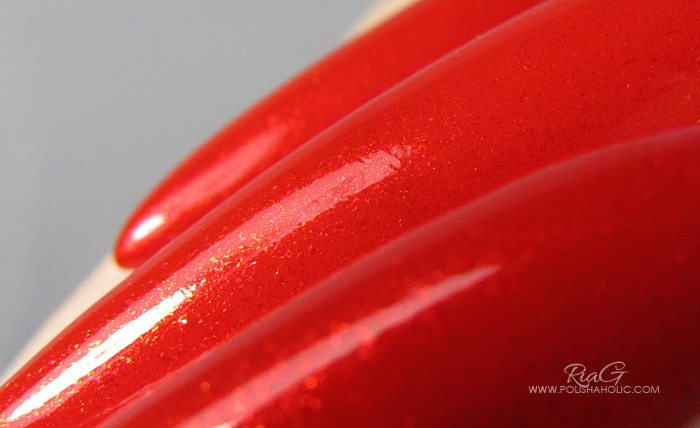 As a jelly this is never fully opaque and it’s also the jelly finish that gives this one the amazing glow. Some of the flakes were a bit bigger and could be felt but a top coat smooth down most of those. Dry time was very quick with Inm Out The Door fast dry top coat. I wore this for two days and had no chipping or tip wear issues. This was perfect in every way! If this was love at first sight for you too I suggest you don’t think about it too long. 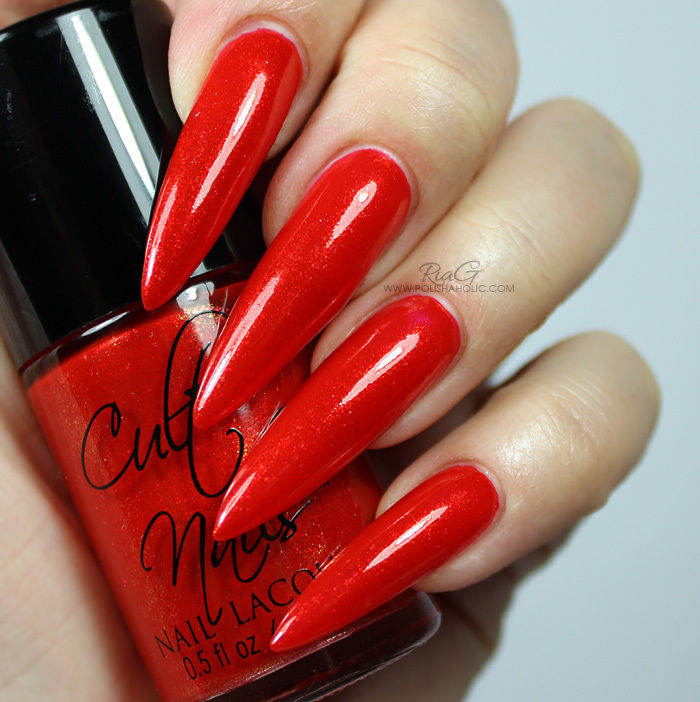 Coveted is a limited edition polish and can be purchased along with other Cult Nails polishes from their website here.